Thread: HEX-V2 and car software limitations? According to info I could get all this should be easily doable on newer MQB platform but not on Sharan/Alhambra 7N. It would greatly help me to decide about investing in the HEX-V2 purchase if anyone could comment on the features above. Also, is there an option that those tweaks would be included in the future VCDS software updates? The question is not what VCDS and a HEX-V2 supports; the question is what the car supports. 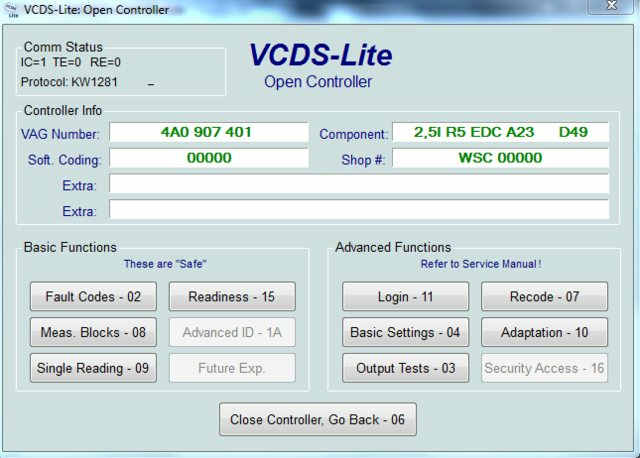 If the car support changing something via the standard diagnostic API, then VCDS can do it (assuming of course that someone has figured out what needs to be done). Unfortunately, I'm not very familiar with the 7N platform, and much can depend on how the particular vehicle is equipped. Since people mention that non-MQB platforms don't require security access / logic code for coding and adaptations, does this mean that the features from my original post won't be supported at all by the car? Given that other/older car platforms also use BCM PQ35 I was hoping to get more info or clues from this domain, because presumably someone has attempted similar things on non-MQB cars. Based on the regulation, the car is required to conform with, fog lights may not be permitted to be used in combination with high beams. That is why the PQ35 BCM has a setting which will deactivate the fog lights once you switch to high beams. The vice versa situation, you are referring to is not manufacturer approved and may not be legal in your country/region. Yes, the MQB BCM can be programmed in a lot of ways, this included. MQB and 7N use completely different ESP/EPB systems and if I remember correctly, the MQB Auto-Hold uses the hydraulic brakes while the 7N Auto-Hold is applied via the actual EPB. So adjusting the strength is not really an option on the 7N. Definitely a no for the PQ35 BCM and door control modules. Any chance you are confusing fog lights with turning lights? The latter can be activated in the PQ35 BCM once the reverse gear is engaged. @Sebastian, this is a very detailed and informative answer, vielen Dank. It makes sense from regulatory perspective re: fog lights and high beams. Technically in stock config the combination of high beams + fog lights only works in manual mode (both required to be switched on manually, Light Assist doesn't work). There's one scenario in particular where I find this useful: winding roads in the woods where one frequently encounters wildlife - a bit of extra side visibility helps spotting the deer sooner. When speaking about reverse gear I was referring to fog lights (I believe in Alhambra 7N fog light doubles as cornering light while in Sharan 7N there's a separate H7 Kurvenlicht bulb). Got engine ECU from Audi 100 C4 2.5tdi AAT. Bosch 0281001128, VAG 4A0907401 (2.5L R5 EDC A23 D49). Protocol: KW1281. First try successfully connected it with VCDS Lite 1.2 shareware using 3rd part KKL cable, just to be sure I wired it correctly on the bench. Start baud 240. Then tried the same with 19.1.2 beta + Hex-V2. Failed. Not possible? Maybe it's limited to HEX-CAN and older? Last edited by _Val; 02-20-2019 at 06:56 AM. If this thing really runs at 240 bits per second, then no, it's not supported by the HEX-V2 or HEX-NET. They don't go that slow; the divisor in the UART section of the microcontroller won't go that low.